Food Wishes Video Recipes: Got Crepes? Make Chicken Cannelloni! As promised, here is what I did with the crepes from the "how to make crepes" video recipe. These thin, almost transparent beauties (crepes are the supermodels of the pancake world) freeze wonderfully. I took them out of the freezer and put them in the fridge to thaw overnight, since the only issue you may have is thawing them too quickly in a hot kitchen may cause the edges to dry out a bit. I was going to do a video recipe of some dessert crepe like crepe Suzette, or maybe crepe cherry jubilee, but since bathing suit season is right around the corner, I decided to do a savory recipe. Dessert crepes are delicious, but not recommended when you're trying to squeeze into a Speedo. 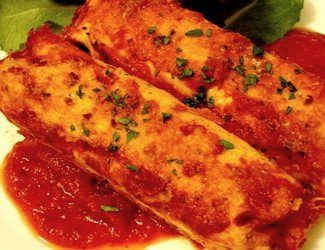 This very simple chicken cannelloni recipe can be made with a variety of meats, cheeses (but use real ones, like the Parmesan shown here) and sauces, so watch the technique and then freestyle. By the way, before you ask, the difference between a cannelloni and a manicotti, is the later is an open tube of pasta, and a cannelloni is normally closed up as you see here. Many restaurants, however, use the terms interchangeably. I sure hope you make some crepes, and then give these a try. Enjoy! I'd rather have a cannelloni than a dessert crepe any day!! 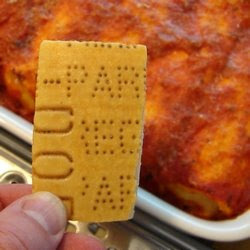 Good idea, I have made cannelloni but never with chicken or crepes. Now you've put ideas in my head! Yes, it is annoying that you made your own fresh cheese... but I am on the EDGE OF MY SEAT waiting for that clip! PLease tell me that it will be less tricky than sourdough starter! I LOVE this recipe. I am going straight to the kitchen to make it with packaged pre-shredded mozza. its the easiest recipe ever! Made it tonight and it was great! Used a bit of feta along with the mozzarella for the filling and it seemed to work well with it. I'm tagging you for my Five Facts Meme. If I make the crepes ahead and freeze them, do I need to put something in between each crepe or will they seperate easily? By the way, this is my kind of recipe which can be said for most of your recipes. Also, the orzo risotto is still one of my favorites and I encourage anyone who hasn't seen it to check it out. No, they will not stick to each other. Just don't thaw to quickly and dont pile up to many and they will be fine. Chef John- These look incredible! And you're right- you simply must use the real cheese. There's no faking the real stuff! Thanks! You can't fake the funk(y cheese)! Oh NO!! This is too delicious! Tried both, the crepes and the canneloni today. Terrific!! did you forget to put egg in the ingredients? Dang thats delicious,you made me hungry,thanks! looks like a great recipe. I'll try it tomorrow. I don't have any left over chicken, so how would you recommend I cook it? Saute in a pan? can i use cottage cheese? Not sure if you'll still check comments from an older recipe. I made the crepes yesterday (and was so proud they came out perfect, just as you said!). Tonight I made the Chicken Cannelloni. It was delicious but my crepes were a little smaller since I used an 8 inch pan to make them. How did you made tomato sos? Blending can tomatos and spising it up with salt and peper will work ? Thanks Chef John for the crepe and chicken cannelloni recipes. They came out great and tasted good as well. I made crepes for the first time tonight just so I could make this. I made this for dinner, and it was a quick, easy, and delicious meal. Definitely, a keeper! a delightful experience with every bite, magnificent. BIG thanks to you Chef John! Made this last week. It was awesome. Love this site, i make 3 or 4 meals a week with a lil help from Chef John. Going to try this with Hot Italian sausage in the crepe batter instead of chicken. Wow how great to find someone that does the canelonis with crepes, i ate them like that while growing up, i can't have them any other way. May i recommend Spinach canneloni, filled with red pepper, onions, boiled eggs and spinach, topped with the same tomato sauce and mozarella cheese. My favorite. Just started watching your videos, very short, informative and helpful. Thanks!